A great tribute to some of the best attractions the Haunt has had. 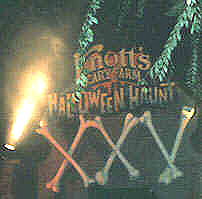 Old horrors such as “Mother Nooses Scary Tales”, “Jack The Ripper”, and “Bait’s Motel” were among the few that contributed to the maze. This was a perfect opportunity for any of the new fans of the Haunt to see what some of the old themes were…A fantastic and well-deserved homage to some of the great attractions. CLICK HERE to view some scenes from the Jack The Ripper section of this maze! The first part of the attraction was a maze. Scientists who were performing studies on a captured Bigfoot, apparently became his victims. As visitors walked-through, the corpses of the scientists warn everyone that Bigfoot is still on the loose. The sets show demolished research equipment, wrecked cages (which could not hold Bigfoot), and ruined campsites. All who entered this maze did have the option of not going on the water ride.